The number of people killed in South Sudan in the latest of a series of cattle raids has risen to more than 200, officials have told the BBC. Jonglei state governor Kuol Manyang said at least 223 people had been confirmed dead. Hundreds more - including many women and children - are believed to be wounded or missing. Cattle raids and revenge attacks have killed thousands of people in South Sudan since independence in 2011. The BBC's James Copnall, in Khartoum, says the fighting involved rival groups from Jonglei state, who clashed over the border in Upper Nile state. Young men from the Murle ethnic group stormed several camps, where the rival Lou Nuer community had taken their cattle, several sources told the BBC. 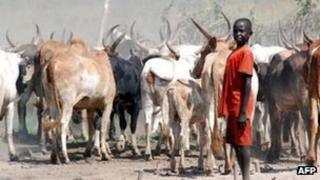 Thousands of cattle are also reported to have been stolen in the raids, which targeted eight areas north of the town of Akobo. Many of the wounded are being sent on a boat ride of several hours to the hospital in Akobo. Aid organisation Plan International says it is concerned about the impact on children, pointing out many have been kidnapped in past raids. Cattle are a main source of wealth and pride for many South Sudanese communities. Following a series of such deadly raids, President Salva Kiir on Monday launched a programme aimed at disarming civilians across Jonglei. The state governor told the BBC disarming everyone might take a year. Some 12,000 soldiers and police are deploying to collect an estimated 30,000 weapons from Jonglei civilians. In January, hundreds of Murle were killed in Jonglei by a force of about 6,000, mainly Lou Nuer, fighters. Thousands of Murle fled their homes as a result of the attacks, which came in response to a massacre that left at least 600 people dead in August 2011. The Murle and the Lou Nuer have a long history of stealing each other's cattle, often prompting a spiral of violence. South Sudan's armed forces and the UN peacekeeping mission said they would send more troops to Jonglei state in response to those attacks. The UN says some 350,000 people were displaced because of intercommunal violence in South Sudan last year. South Sudan is one of the world's poorest regions and has hardly any roads, railways, schools or clinics as a result of two decades of conflict leading up to independence from Sudan in July 2011.